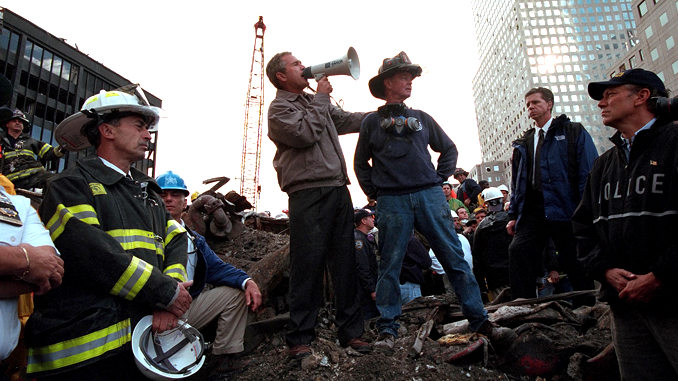 Standing upon the ashes of the worst terrorist attack on American soil, Sept. 14, 2001, President Bush pledges that the voices calling for justice from across the country will be heard. Responding to the Presidents' words, rescue workers cheer and chant, "U.S.A, U.S.A." White House photo by Eric Draper. On the anniversary of TNB, I wanted to demonstrate that some things really don’t change. In 2006, the country was in the middle of a fight about President George W. Bush. There was hate and rancor on both sides, being ginned up by the punditry. I was, at that time, a regular listener to that punditry and greatly appreciative of some of them. That has absolutely changed. It didn’t mean, however, that we needed to buy into the hatred. One could be partisan – and I was, proudly, because my party was still representing values I believe in – but that didn’t mean we had to be dismissive and contemptuous of everyone who disagreed. We all have differing opinions, and a matter of respecting each other as fellow Americans and thinking adults should mean granting the ideas of others a fair hearing and as objective an analysis as we are able to muster. It doesn’t mean changing our opinions, but it means being open to considering other opinions fairly. Let’s get the most important thing out of the way first: the other side isn’t (generally) evil. They aren’t trying to undermine the country, they aren’t engaging in giant conspiracies. They simply have different opinions. Now, at this point, I could be on either side. Because I haven’t stated my political leanings yet, some of the people reading this (the ones who aren’t otherwise familiar with me) are probably paying attention. The second I declare my orientation, a significant portion will immediately tune me out. That’s not stupid; that’s willfully ignorant, which is far worse than stupid. Stupidity can often be overcome with time and effort. The left and the right both want the same things, generally. They want freedom, happiness, a good education for their children, a chance to have a good job and some possessions. They just vastly disagree on how to get there. Those disagreements don’t make the other side evil, or hateful, or anything else. It might on occasion make them wrong. It’s easy to make the mistake of attributing bad intentions. After all, if your intentions are good (and most people view themselves in a positive light) and your opponent disagrees with you, his intentions must be bad, right? No. That’s like saying that because your poker hand is a flush in hearts, and your opponent has all clubs, that they can’t have a flush. Two people can try to arrive at the same endpoint by different means. Pick any topic in the US, or Canada, or the UK, and you’ll find two or more groups trying to arrive at the best possible solution. Often they’ll use different methods. It’s up to you to divorce yourself as much as possible from which side is saying which, and decide what method makes the most sense to you. Then, on that issue, support whatever side is pushing that method. Yes, some things absolutely do change. My life is far different than it was in 2006; I’m married, I have a wonderful child, I’m no longer a proud Republican and I’m part of a news/opinion site that’s trying to stand for what would have been mainstream political thought in 1985. I was chastened, during a clash at another site, for being consistent. I do not consider that a detriment. It is a label I wear proudly, and it relieves me to see so many others sharing that view. I’m going into the next year, and more, with the intent to bring others away from reflexive hate and toward honest consideration of the day’s events. Thank you, everyone, for coming with me.